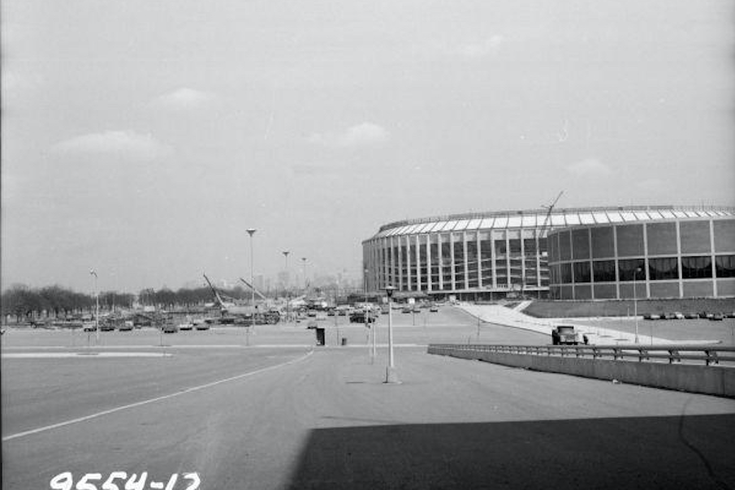 Veterans Stadium in South Philly, the home field for the Philadelphia Phillies from 1971-2003, is shown in this photo taken April 7, 1970. In the foreground is the Spectrum, which closed in 2009 and later was demolished. For many Philadelphia sports fans, memories of Veterans Stadium probably consist of the 700 level, its horrible turf field and the Liberty Bell replica that was once clocked by a monster Greg Luzinski home run. It looks like Phillies fans will soon see the latter of the three again. Crossing Broad reported on Friday that the Phillies have the 20-foot-high, 15-foot-wide replica of Philadelphia's historic Liberty Bell in their possession and plan to display it in its current home as early as the 2019 season. James Trout, the Phillies' director of marketing services and events, told the site that the team plans to refurbish the bell in the meantime. Where the team plans to display the bell within the park is not yet known, according to the report. The Vet, as Philly fans called it, was home to the Phillies and Eagles for four decades on Broad Street and Pattison Avenue until its demolition in 2004. The bell, which was initially displayed on the facade of the 400 level before being moved to the top of the upper bowl in center field, apparently wound up in the possession of C.W. Dunnet and Co., a South Philly food distributor who acquired the bell from the Phillies sometime in the late 2000s. After plans to refurbish the bell and display it atop its business never materialized, C.W. Dunnet reportedly returned the bell last fall to the Phillies, who had reached out to the company about potentially re-acquiring it.